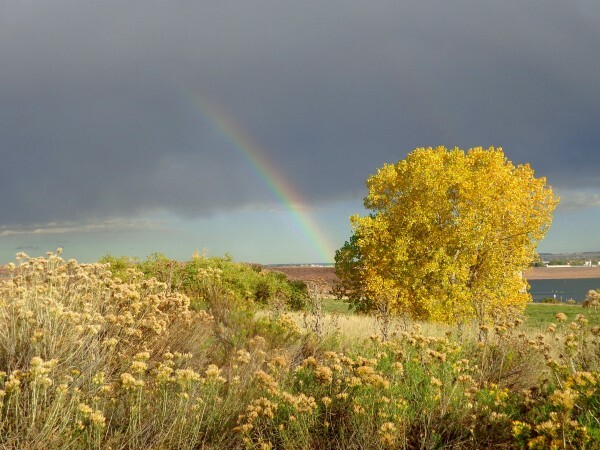 Free high resolution photo of a rainbow disappearing behind an autumn tree full of yellow or golden leaves. This photo was shot at Chatfield State Park in Littleton, Colorado just south of Denver. In the foreground you can see some rabbit brush and other vegetation. The rainbow comes out of a dark sky and appears to end in Chatfield Lake just over the dam. The tree with yellow leaves is probably a cottonwood. Free photo for any use.